Demand for recreational marijuana in Canada will be much stronger than industry officials expect, according to data given to Health Canada by one influential research firm. Stronger-than-expected demand could have consequences up and down the cannabis supply chain. Cultivators, for starters, could ring up more sales if they’re able to grab a slice of an expanded market, analysts say. In addition, stronger marijuana demand could spell tougher competition for alcohol companies. Miles Light, a co-founder and partner with Marijuana Policy Group (MPG) – a Denver firm that provides analysis, investment and policy advice to private and government clients – said Canadian demand for marijuana flower equivalent could exceed 900,000 kilograms (992 tons) next year. That’s 40% higher than the two most-cited estimates: Deloitte’s August 2016 estimate of 600,000 kilograms, and the Parliamentary Budget Officer’s projection of 650,000 kilograms. “In our view, demand has been underestimated because the number of heavy users in Canada had been underestimated,” Light told Marijuana Business Daily. He declined to provide specific answers on expected demand given MPG’s ongoing work with the Canadian government. Health Canada selected the firm to estimate the size of the country’s marijuana market. The government agency has yet to publish the data. Light summarized his findings at last month’s MJBizCon, which is run by Marijuana Business Daily. Why does MPG project stronger demand? Light pointed to the dates of the surveys used to compile the PBO projections and his firm’s estimate for Health Canada. “The difference between the (Parliamentary Budget Officer) estimate and us is that they used a survey from 2012 and we used a survey from 2017,” Light said. “The difference in these surveys is that very few people reported heavy use in the 2012 survey – only 12%. As in other legal markets, a small share of heavier users accounts for most of the demand (by weight). In Canada, about 25% of users will account for 80% of recreational marijuana demand, according to MPG’s estimates. A market that’s 40% bigger would mean more money up for grabs, and that could mean higher-than-expected revenue across the marijuana supply chain. Their ability to lure existing customers away from the black market. Their ability to attract first-time cannabis customers. For some licensed cultivators, it could hinge on their ability to lock up supply arrangements with provinces. New Brunswick has struck agreements with three licensed producers to buy 13,000 kilograms of cannabis per year worth about 140 million Canadian dollars ($111 million) to meet demand for its recreational market when adult-use marijuana is expected to be legalized next summer. 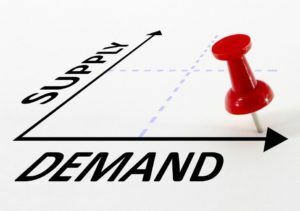 Khurram Malik, a partner at Jacob Capital Management, said if demand is higher than expected by 2019, then some companies can expect higher revenue in provinces that don’t have distribution constraints, such as a limited number of government-run retail outlets. “Companies well positioned to take advantage are those who are structured to leverage the unique characteristics of each province’s distribution model,” he said. Companies that can capitalize on the higher demand by stockpiling cash would also be better positioned to bankroll more mergers and acquisitions as well as international expansion. Michael Lickver, executive vice president of Wheaton Income – an investment company that trades on the TSX Venture under the symbol CBW – said more revenue could mean more export opportunities. “Any cash that comes through the door, they’re going to plow it to expansion,” he said. “So if demand is higher, I can see more M&As where companies with more cash are buying the smaller players. The impetus for international expansion is potential growth overseas: “Canada’s market for recreational marijuana is a drop in the bucket compared to the potential market for medical marijuana in Germany and Latin America,” Lickver said. “Germany is 80 million people. There are companies in Africa that are going to be opening,” he added. If recreational marijuana demand is indeed stronger, the alcohol industry could face even tougher competition from adult-use cannabis. He suggested that people might pass on picking up a bottle of wine on the weekend to enjoy some cannabis instead. Canada’s private sector and government-owned liquor outlets sold CA21.3 billion ($16.1 billion) worth of alcoholic beverages in the fiscal year ending March 31, 2015, according to Statistics Canada, including CA$9 billion of beer. That’s a little less than Canada’s black market for marijuana, which one recent estimate pegged at CA$22 billion — including exports. Good point here that very safe and beneficial Cannabis will reduce sales in killer dangerous Alcohol..and BIG PHARMa, and Tobacco products, which is why they oppose. Keep in mind they do not care about the damage and death they cause,just profits at any cost. Too bad they get reduced, and save lives, eh? People prefer safe and beneficial Cannabis, that cannot kill, as we see. Supply is set to increase to match demand as well. About time truth is allowed in law. Everywhere! I don’t think the demand will be nearly as high as you estimate, Matt. To imagine heavy users severing ties with their dealers makes no sense, particularly in light of the fact that they’ll be able to get a much better price point from their dealers versus what state or private sellers can offer. All signs point to a massive oversupply by early next year. Between the estimated 1.2 million tons of legally grown product and the unknown but quite massive black market quantity, there will be price wars in the legal and black markets, and it will be great for consumers, who will finally have to spend a much smaller portion of their income on what for far too long has been an extremely overpriced commodity. Untested Black Market Weed will become very unpopular – very quickly – once the Lab-tested (Safer) Marijuana is available. People are getting more and more health conscious, and the idea of smoking pesticides, heavy metals, mold, etc will have no appeal once the legal, quality controlled product is on the shelves. Even if the lab-tested buds cost a few dollars more it’s worth it. I am invested heavily in the Cannabis market. I own 24 of the more popular companies like Canopy, Aurora, Aphria, Zyne, Inmed Medleaf, Cannabis Wheaton etc. HOW LONG DO YOU THINK I WILL NEED TO HANG IN UNTIL I SEE SOME SIGNIFICANT VALUE IN MY STOCKS??? Thanks.